It’s Official! Lane Kiffin is USC’s new head coach and he’ll bring Dad Monte and former USC assistant Ed Orgeron with him. There will be a press conference from USC’s Heritage Hall at 4pm on Wednesday. NORM CHOW IS COMING BACK TO USC! OMFG!!!!!!! Back in 2001 when USC fired Paul Hackett and eventually hired Pete Carroll, the hire took 18 days. We’re into day 2 here and its already damn depressing to this Trojan fan. Hey, look I KNOW our AD is a jackass who doesn’t get along with anyone and I KNOW our President is retiring in August and then of course I KNOW we’ve got those pesky pending NCAA sanctions. Really? No one wants us? Jack Del Rio is staying with the Jacksonville Jaguars. I can’t blame him, his guaranteed $15 million over the next two years would be hard to pass up (in other news- is he single? HA HA HA I kid I kid! Um, sort of. He is a Trojan Alum after all!). Jeff Fisher is reportedly not all that interested due to the looming NCAA penalties. Steve Mariucci was spotted on campus today.I am not sure how I feel about that just yet, but I am not jumping for joy. Herm Edwards and Jon Gruden are, in this Gridiron Goddess’s opinion — entirely wrong for the job. Chris Petersen at Boise State – well that COULD be interesting. But can he win off the Smurf Turf? Dirk Koetter and Dan Hawkins haven’t fared all that well since leaving Boise. Koetter crashed and burned at ASU while Hawkins has been mired in controversy and struggle at Colorado. Like I said, this is all just damn depressing. And I worry. I worry that we’ll end up with the second coming of the Paul Hackett years. And as we all know, those were dark days indeed for USC Football. All weekend the rumors have been flying around the Internet and ESPN. Beloved USC Coach Pete Carroll – in talks with the Seattle Seahawks? Say it isn’t so Pete! But alas, it is so. Carroll officially handed in his resignation at USC on Sunday evening. All week I will do a retrospective of the Pete Carroll years here on Gridiron Goddess. Most Trojan fans look at his era as having two distinct periods 2001-2005 and 2006-2009. Carroll brought glory back to the USC football program. After mediocre runs by Ted Tollner and Larry Smith and the second coming of John Robinson, USC football found itself in the dark period known as the Hackett years. Paul Hackett was disastrous for USC football. When Pete Carroll came in, he turned it around. He exuded the boundless energy and enthusiasm of a teenager. He embraced USC’s traditions and customs and forged a few of his own. Open practices, famous alumni stopping by for pep talks, his infamous pranks – Carroll embodied everything we love about USC for nine years. He will be missed. All weekend my Trojan friends and I have been in mourning. How can you replace Pete? You can’t. You just move forward. You remember what it was like when you had the perfect coach for your team. We’re incredibly grateful for the run we had with Carroll at the helm. In his nine seasons at USC, Carroll went 97-19, winning two national championships, coaching three Heisman Trophy winners, playing in seven consecutive BCS Bowls and winning seven Pac-10 titles. He’s sent a crazy impressive 53 Trojans to the NFL over eight seasons. Expect 10 or more to join those ranks this year as well. The entire USC family owes Coach Carroll a debt of gratitude. Never has it been more fun and more exciting and more spirited and more USC than in the Pete Carroll years. He leaves a gaping hole where his giant personality and huge heart resided. Heritage Hall will be quieter without Pete. Sure, we’ll get a new coach and we’ll be a great team again. USC is still USC with or without Pete Carroll. But it will never be the same. 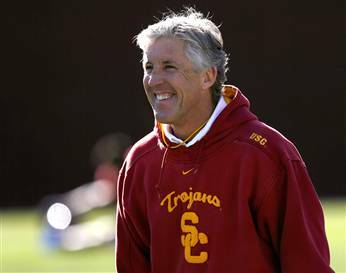 Pete Carroll and the University of Southern California were a perfect match for each other. The kind of kismet that happens once in a lifetime. Next up: A look at Pete’s introduction to USC and his 2001-2002 Trojan football teams. Oh hello there! Are you here because you figured I’d have a lot to say about Pete Carroll, USC, NCAA Sanctions, Mike Garrett, the Seattle Seahawks and potential new USC coaches? You would be right. I DO have a lot to say about it. Watch this space, post will go up sometime Sunday night/early Monday morning. The anxiety! It’s not good! ESPN is reporting that beloved USC football coach Pete Carroll is likely to depart Troy for Seattle. NO!!!!! Now add to this Itunes eating my entire music library (have spent past 24 hours recovering. it’s not pretty) AND my move in 18 days and I. Just. Can’t. Handle. It. Don’t break up with the Trojan Nation Pete. We love you long time. I do suspect that if Carroll does take the Seahawks job, it won”t bode well for USC. Pending NCAA sanctions could be the reason for his defection. Oh! 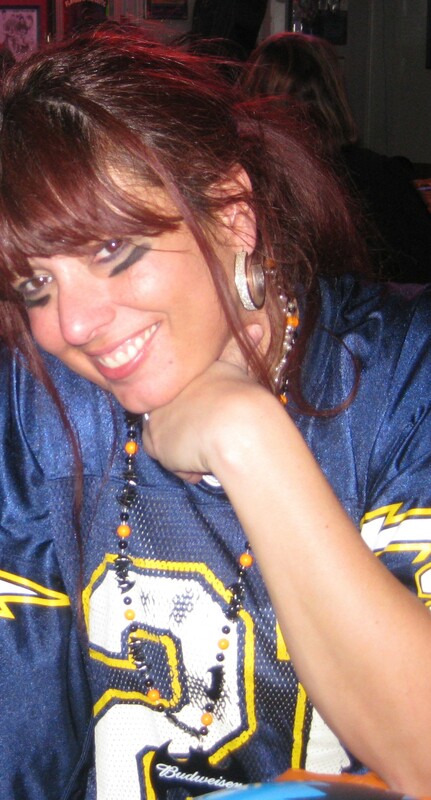 And check this out: Gridiron Goddess was named one of the top 101 Women Bloggers to watch in 2010. ETA: How could I forget? (um, see above chaos?) Congratulations to the Crimson Tide of Alabama, the 2009 BCS National Champions! I swear I have not fallen off the face of the earth or succumbed to the swine flu (tho NEARLY! Still COUGHING for f*cks sake). I am just OMFG BUSY. I have PLENTY to say on the Joe McKnight business, USC’s Men’s Basketball team self-sanctioning themselves (this way if and when USC football gets the smack down from the NCAA, its a FIRST offense. Wily, no? ), Stafon Johnson’s inclusion in the Senior Bowl and all things Texas vs Alabama. The NFL Playoffs- MEH. Seriously Bengals -Jets AGAIN? Dallas- Philly – AGAIN? Yawn. This is why I am typically MEH on the first weekend of the NFL playoffs. Oh make no mistake, I’ll watch. But I can’t muster any enthusiasm for it. OK I seriously will be back in a day or two or maybe four with something compelling to say about the sport we all love. Until then, I am apartment hunting in Los Angeles on a budget – holy crap is that ever a formidable task! PS – Hey! Happy New Year! You are currently browsing the Gridiron Goddess blog archives for January, 2010.